U.N. High Commissioner for Human Rights Michelle Bachelet attends a news conference at the United Nations in Geneva, Switzerland, Dec. 5, 2018. 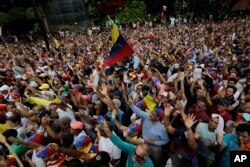 U.N. rights chief Michelle Bachelet has called for talks to defuse the political tensions in Venezuela, saying that the situation "may rapidly spiral out of control with catastrophic consequences." In a statement Friday, Bachelet called for an independent investigation into the violence that has killed 20 people and detained more than 350 in protests over the past week. "More than three million Venezuelans have fled the country, many millions of others are living in totally miserable conditions," she added. "This is, at heart, a crisis of governance, and it is the responsibility of the country's leaders to put an end to this disastrous situation." The United States has requested a public meeting of the United Nations Security Council to be held Saturday, at which U.S. Secretary of State Mike Pompeo is expected to speak. 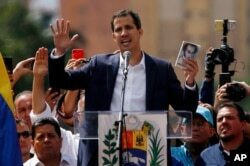 FILE - Juan Guaido, head of Venezuela's opposition-run congress, declares himself interim president of Venezuela, during a rally demanding President Nicolas Maduro's resignation in Caracas, Venezuela, Jan. 23, 2019. The U.S. State Department said Pompeo will "underscore the administration's support for the Venezuelan people" by urging members of the Security Council to recognize National Assembly President Juan Guaido as interim leader. But Russia is opposed to the move. Reuters reports that when questioned about a possible Security Council meeting, Russian Ambassador to the U.N. Vassily Nebenzia said Thursday, "That's their internal business." U.S. President Donald Trump bluntly warned Maduro on Thursday that "all options are on the table" if there is not a peaceful transition to democracy in the South American country. On Wednesday, Venezuela's disputed president, Nicolas Maduro, said he was ending diplomatic relations with the United States in response to Trump's announcement that the U.S. was officially recognizing Guaido as Venezuela's interim leader after Guaido swore himself into office. Maduro ordered U.S. diplomats to leave within 72 hours. However, Pompeo said Maduro no longer has the authority to issue orders. Thursday, 16 of the 34 nations in the Organization of American States (OAS) recognized Guaido as interim president of Venezuela at an emergency session. Anti-government protesters hold their hands up during the symbolic swearing-in of Juan Guaido, head of the opposition-run congress who declared himself interim president of Venezuela until elections can be called, during a rally demanding President Nicolas step down. Meanwhile, the State Department ordered non-emergency personnel to leave Venezuela, but it is not closing its embassy in Caracas. French President Emmanuel Macron called Venezuela's elections "illegitimate" in a tweet Thursday, and saluted the bravery of Venezuelans demanding freedom. 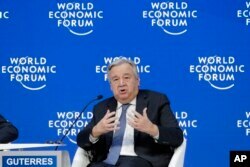 Antonio Guterres, Secretary-General of United Nations addresses the annual meeting of the World Economic Forum in Davos, Switzerland, Jan. 24, 2019.